Francis Graham Wilson was a central figure in the revival of interest in political philosophy and American political thought in the mid-twentieth century. While he is best known as a Catholic writer and conservative theorist, his most significant contribution is his original interpretation of the development of American politics. Central to his thought was a process of self-interpretation by the citizenry, a quest for ultimate meaning turning to a divine, transcendent, basis of history and shared experience. 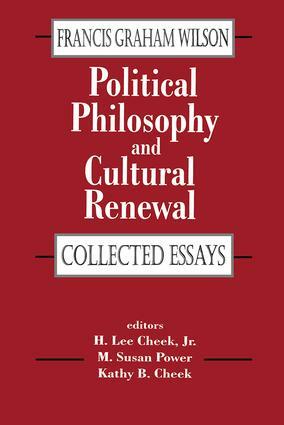 Although Wilson's writings were extensive and influential, they have not been readily available for decades.